There are an estimated 25 to 50 deaths each year in the United States from the effects of mudslides. These are quick-moving areas of dirt, rock and debris that have been saturated to the point where they can no longer defy gravity on a slope, hill or mountain. Mudslides are destructive, and some of the worst disasters in history have involved mudslides, many brought about by volcanic activity. Most mudslides are minor in nature and involve only a small chunk of a hillside coming down during or after a particularly hard downpour or a fast melting of snow. 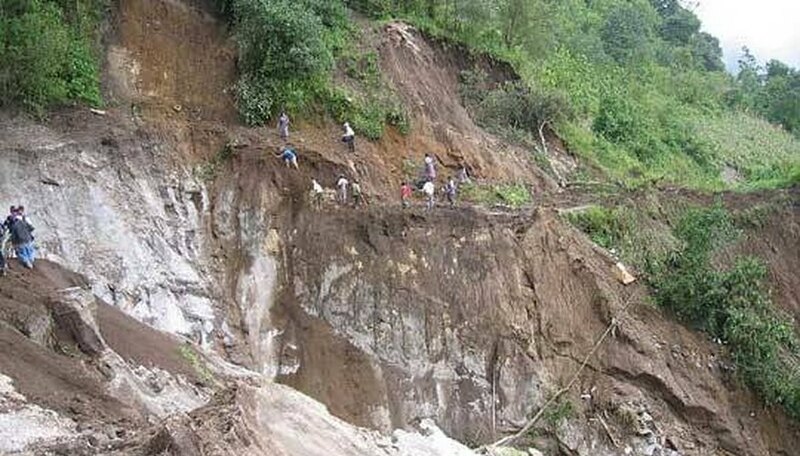 Mudslides differ from landslides in that landslides are composed of rocks, soil and debris that has come loose from a steep slope and tumble down. Mudslides tend to flow down a channel in a hillside or mountainside. Most mudslides are the result of heavy rain which causes water to build up in the soil at an overwhelming rate. The ground finally becomes so saturated that gravity takes over and the mudslide comes down. Mudslides can move as rapidly as 35 mph and destroy anything in their path. Areas that have been under long drought conditions can be vulnerable to potential mudslides when it finally does rain heavily. The topsoil is loose from the lack of water and the deluge can easily precipitate saturation of the ground. Some spots are much more at risk of mudslides than others. If there have been wildfires in hilly terrain, the lack of vegetation to prevent erosion can mean mudslides under the right circumstances. Mudslides are also known as debris flows. They can be composed of watered down mud or have a thick consistency to them. Once they are moving downwards, mudslides can carry away homes, huge boulders and even uproot trees. Power lines, gas lines and sewerage lines can all be affected by mudslides, which will spread out over a great area once they reach flat ground. When this happens, depending on the size of the flow and the area where it winds up, mudslides can reach great depths as they deposit all the debris they have gathered on their trip downwards. The deadliest types of mudslides are called lahars. These are almost always associated with a volcano and can be incredibly destructive. Lahars occur in most cases when volcanic activity causes a dramatic and sudden melting of snow and ice around a volcano. The lahar will gain the consistency of concrete and be very powerful, annihilating everything in its path and then finally covering whatever area it ends up at to great depths. Lahars can also be brought about when heavy rain makes volcanic deposits of ash suddenly break loose from a mountainside (see Resources below). The deadliest mudslide in recorded history occurred in 1985 in Colombia, South America. The volcano known as Nevado del Ruiz erupted in November of that year and created a huge series of lahars that swept down the mountain and towards the city of Armero. The residents there were buried by the mudslide to a depth of 16 feet; only 5,000 of the 28,000 people living there escaped with their lives. It was the worst natural disaster in Colombian history. Lindell, John. "About Mudslides." Sciencing, https://sciencing.com/mudslides-4727599.html. 24 April 2017.